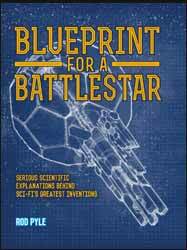 Packed with images, including 75 illustrations created exclusively for this book, Blueprint for a Battlestar takes twenty-five remarkable and memorable technologies from the world of sci-fi, from Star Wars and The Matrix to Ironman and The Terminator. Each concept is explained and dissected to reveal the real science behind it. Some are boldly obvious – such as the Death Star and exoskeletons – and some less so (think bioports or cloaking devices). All are fascinating and will make wonderful explorations into the science of the future, as we understand it today. The book opens with a handy index that runs through the technology that will be explored in the book, the author then looks at how feasible it is, the closest that we have so far come (in some instances hinting that research maybe further advanced than is publicly known). It's a fun book that offers serious exploration of some of the technology that could be common place in the not too distant future.